SAFFORD, AZ — Safford police and the Arizona Interscholastic Association are investigating a fight that took place after a high school wrestling match in Safford Saturday. The fight took place between Salpointe Catholic High School and Canyon del Oro High School at a sectional meet at Safford High School, 1400 W. Bulldog Blvd. 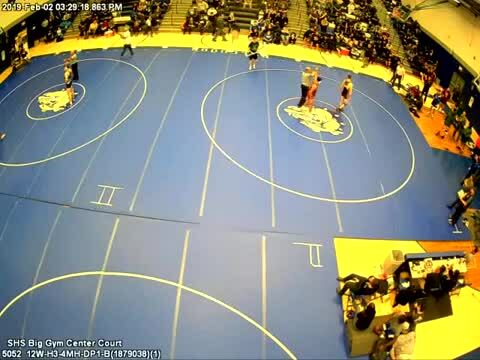 Video of the incident provided by Gila Valley Central appears to show a disgruntled wrestler who had been disqualified from a match attacking an adult after a match. Safford police are investigating, Gila Valley Central reports. Upon arrival to the school, Safford officers learned that a wrestler for the Canyon Del Oro High School (Michael Buda, 18 years of age) had aggressively tackled the coach of his opponent team. Team members from both teams, officials and school staff attempted to restrain Michael Buda, at which time his father (Michael Buda 39 years of age) crossed a barrier and came onto the mat area in an aggressive manner, creating the need to restrain him as well. The Safford Police Department said in a statement that the 18-year-old wrestler from Canyon del Oro tackled the Salpointe coach. Players, coaches and staff attempted to restrain the wrestler, at which point the wrestler's father came down from the stands and entered the mat area "in an aggressive manner" that required he be restrained by others, police said. ABC15 is not identifying the wrestler or his father because charges have not been filed. Police say the investigation is ongoing. According to AIA spokesman Seth Polansky, the organization is also looking into the matter. "Yes, the AIA is looking into the situation," Polansky said in a statement. "The association is still awaiting all the reports mentioned in the article you provided. Once the reports are in, the administration will review all that occurred and take action if necessary. There is no timetable on when that will happen at this point."